Auth Florence CBU mailboxes are the most durable, highest quality USPS approved outdoor cluster mailboxes on the market and continually meet or exceed USPS standards. Auth Florence Manufacturing is the sole supplier of commercial CBU mailboxes to USPS. Florence F-series cluster box units have been officially licensed by USPS as the “design standard” that all other commercial mailbox manufacturers must follow. Florence Manufacturing Company offers a 5-year Product Warranty (from purchase date) on all Florence cluster box unit CBU mailboxes. 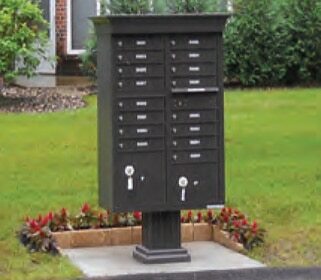 The Florence mailbox warranty covers any defects in workmanship or materials. For more details see our CBU Product Warranty PDF file. As of 2005, USPS approved Florence CBU mailboxes have become the industry standard for outdoor centralized mail delivery systems. CBU mailboxes offer improved security however; The MailboxWorks recommends that prior to installation, you should first check with your local postmaster to confirm the location of proposed CBU mailbox placement. Once installed, the United States Postal Service will also need to be contacted to have them install the master lock for the CBU mailbox main access door. Only USPS can install master locks and only they will have access to the master lock keys. Florence Manufacturing is the only authorized mailbox supplier to the United States Postal Service. 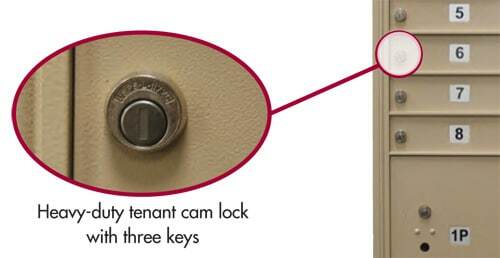 Each tenant mailbox on the Florence CBU mailbox unit includes a heavy-duty, 5-pin stainless steel cam lock plus 3 tenant mailbox keys. The cam lock also includes a rain shield to protect it from rain and other inclement weather. 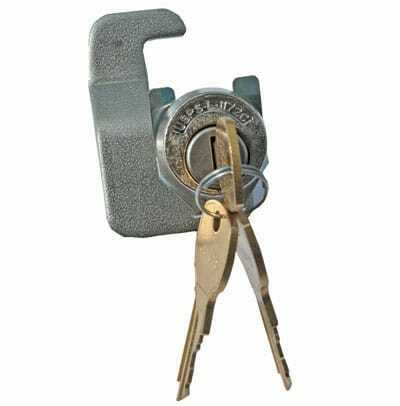 Extra tenant mailbox keys and replacement locks can be ordered online on our replacement parts MailboxWorks page. The compartment size on each tenant mailbox is now a USPS standard. Compartments were designed to be wide enough to allow larger envelopes, magazines and small packages to lie flat without having to be folded. USPS regulations now require all CBU cluster box mailbox units with 10 or more tenant mailboxes to include at least one parcel locker. See our CBU FAQs for more detailed information on how parcel lockers work. 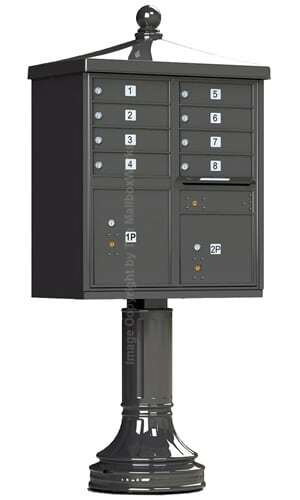 Finished in a durable powder coat finish, all Florence cluster box CBU mailboxes are designed with reinforced steel. They also include overlapping interlocking seams and aircraft grade aluminum construction to ensure your mail remains secure and adequately protected from would-be mail thieves. For private mail distribution or any application that does not use US Postal Service, our CBU commercial mailboxes can be ordered with a private master lock and outgoing mail slot. 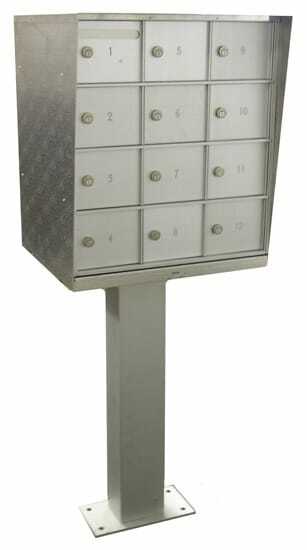 Ask us about USPS approved, vandal proof, secure CBU mailboxes with reinforced metal and pry-resistant master doors. These are ideal for use as government or military centralized mail distribution systems. Ask us about CBU mailbox door decals or custom engraving. Standard CBU mailbox doors come with adhesive decals with black lettering. For custom engraved mailbox door decals you can choose no fill, black filled, or white filled numbers. Although sandstone is the most popular color ordered, Florence cluster box unit CBU mailboxes can be ordered from The Mailboxworks in 4 different color options. These include dark bonze, black, postal grey, and sandstone. All CBU mailboxes also feature a tough powder coat finish. Who Buys CBU Cluster Mailboxes? The MailboxWorks’ Florence CBU mailboxes for sale are highly secure, locking commercial mailboxes. 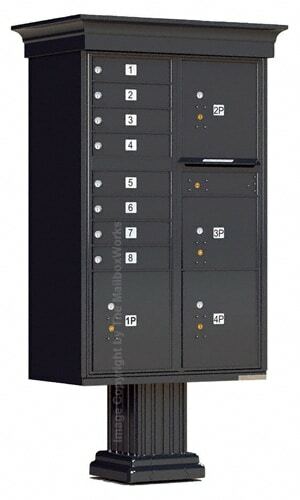 These cluster box units are designed for installation in any apartment or office complex that utilizes either an indoor or outdoor centralized mail delivery system. With a Florence CBU mailbox installation you get the same level of security and dependability demanded by the United States Postal Service. 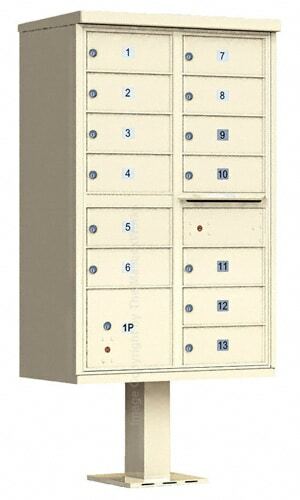 Florence cluster box unit CBU mailboxes may also be utilized for “Private Mail Delivery Service.” Private use CBU mailboxes require a Florence Mailbox Conversion Kit, to convert the CBU mailboxes from Postal to Private Service mailboxes. The Florence mailbox conversion kit will allow your company to access the CBU mailbox master door for private mail distribution. Although no longer USPS approved for new buildings, Bommer NDCBU mailboxes can still be used for mailbox replacement purposes, once approved by your local postmaster. Bommer NDCBU mailboxes are also ideal for custom uses including for private mail distribution. 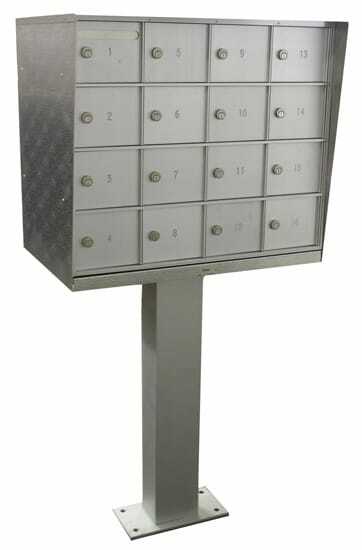 Florence cluster box CBU mailboxes are specifically designed for installation on a CBU pedestal, which is packaged separately. The aluminum CBU pedestal comes fully assembled and includes mounting hardware. 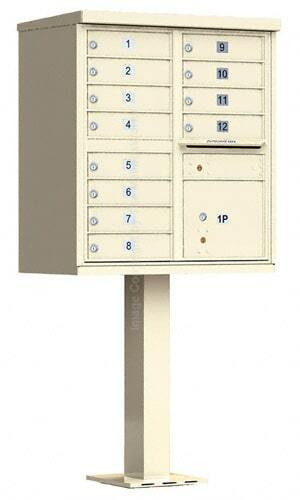 CBU cluster box mailboxes can be installed on new concrete or an existing concrete base. See our CBU mailboxes installation guide. Once the CBU pedestal mailboxes are installed it will be necessary to contact the United States Postal Service. Only USPS can install the main access door master arrow lock and the capture locks on the parcel lockers. The Vogue Traditional and Vogue Classic mailbox accessory kits come with roof caps and ball finials, plus decorative post columns post base, and your choice of 4 door-numbering options. These CBU mailbox hardware accessories are made from 100% die cast aluminum, come in all standard Auth Florence Manufacturing finishes, and do not require modifications for installation. All CBU mailboxes are already discounted from the manufacturer’s recommended list price. However, The MailboxWorks also offers quantity discount pricing on CBU mailbox orders between 2 – 5 units (plus even better pricing on 6 or more CBU mailbox units). The MailboxWorks offers a selection of cluster box unit replacement parts. These include tenant mailbox door replacement locks, key blanks, replacement cams, mailbox number decals, outgoing mail decal, mounting hardware, and mailbox replacement doors. Free shipping is included on CBU mailbox purchases (unless stated otherwise – depends on the product selection). To expedite delivery times, all CBU mailbox orders are shipped directly from the manufacturer using common carrier delivery. Standard cluster mailbox orders will generally ship in 2-3 business days with a delivery time of 1–5 business days, depending on where you are located. Custom CBU mailbox orders will generally ship within 1 to 2 weeks with an estimated delivery time of 1–5 business days. MailboxWorks specializes in all things related to mailboxes for sale. We offer bulk discounts when you order two or more of these CBU mailboxes at one time. Please fill out our CBU commercial mailbox quote request form or contact our mailbox experts directly. Can I mount the CBU mailbox on an existing pedestal? We do NOT recommend this. Old or used CBU pedestals may not be as strong or have corrosion issues, which could cause the CBU mailbox to collapse. The CBU cluster box unit can weigh up to 150 lbs and needs to be properly supported. 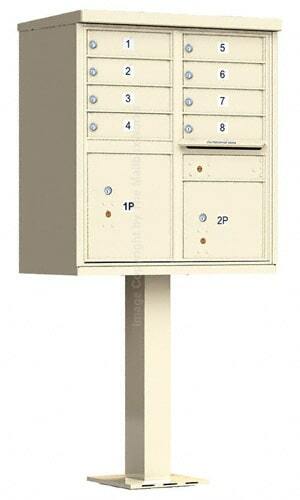 Using an old CBU pedestal can cause potential danger to your USPS mail carrier, tenants, and innocent bystanders. Can I mount the CBU mailbox on a pedestal other than the factory supplied pedestal? We do NOT recommend this. 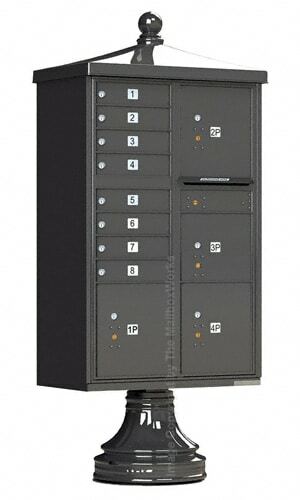 The pedestals that come with CBU mailboxes are specifically designed to support the cluster box unit. Should you decide to use a different mounting method or pedestal (other than the factory supplied CBU pedestal and instructions) you need to obtain approval from your local USPS Postmaster. Can I adjust the height of the CBU mailbox during installation? No. CBU’s must be installed at the exact height requirements as specified by the USPS. Can CBU cluster mailboxes be mounted on a wall instead of a pedestal? No. 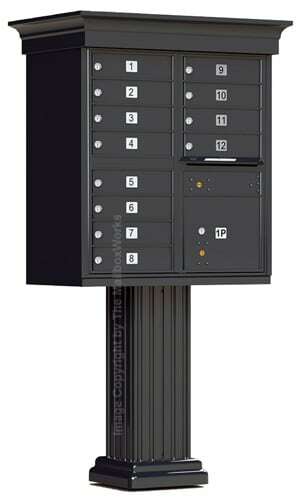 Cluster mailboxes are only manufactured to be mounted on a pedestal and cannot be mounted to a wall. The CBU cluster mailbox needs some sort of structure below to support it. NOTE: INSTALLING OR MOUNTING YOUR CBU MAILBOX ON ANY PEDESTAL OR SURFACE OTHER THAN THE FACTORY SUPPLIED PEDESTAL CAN VOID YOUR LIMITED MANUFACTURER’S WARRANTY. If you are located near the Greater Chicago area and you need help mounting your CBU mailboxes, The MailboxWorks also offers CBU commercial cluster mailbox installation services. Do I need to contact my local USPS before installing a cluster box unit? Yes. Contact your local postal officials before installing CBU cluster mailboxes, as the USPS has the authority to determine the placement of your new cluster box unit. Does my CBU mailbox come with everything needed for installation and usage? 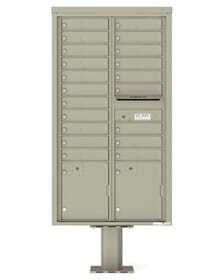 USPS Arrow Locks – installed on outgoing mailbox door and parcel locker doors. USPS does not allow factories or any non-USPS employees to possess these master locks. Once you have your cluster box unit installed you will need to contact your local USPS to request that they come and install the USPS Arrow Locks. Typically, they do not charge for this service. Anchor Bolts – used for mounting the CBU mailbox to concrete, which requires 4 bolts per unit. USPS requests that The MailboxWorks and other mailbox distributors do not include concrete mounting anchor bolts because there is too much variation in each individual installation. Please refer to our CBU Installation Instructions to determine the anchor bolts required for your mailbox installation. The factory recommends that you use ½-inch diameter L-Bolts and a range of expansion anchor bolts outlined in the instructions. For most applications, you can purchase the L-bolt anchor bolt kit at The MailboxWorks and any expansion anchor bolts at your local hardware store. Help! I can’t find the tenant keys (or mounting hardware or installation instructions) for my new CBU cluster mailboxes. Take the cluster mailbox module out of the box and set it on a workbench. Open outgoing mailbox door (located below the outgoing mail slot on the right-hand side). Carefully push up on latch on the left side of the inside of the outgoing mailbox compartment (your CBU mailbox will be top heavy). The right side of the CBU cabinet will open and there will be a latch on the left side of the cabinet to open completely. You will find all the keys, hardware, and instructions in the lower left hand compartment. Why did my CBU mailbox not come with anchor bolts? USPS requests that we do not provide anchor bolts as each individual installation varies. The MailboxWorks sells the basic L-bolts but you will need to refer to CBU Installation Instructions by the USPS to determine what expansion bolts you will need to purchase at your local hardware store. Why is there no lock on the CBU outgoing mailbox? The parcel locker is a component of the CBU cluster mailbox system that allows for delivery of larger parcels for your tenants. How to open a parcel locker. USPS mail carrier places the package inside a parcel locker. USPS mail carrier then places a corresponding key and instructions in the tenant’s regular mailbox. 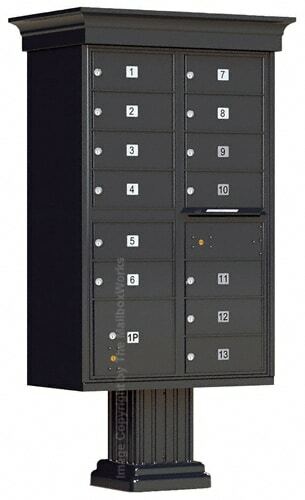 The tenant receives the parcel locker key and instructions from their own mailbox. 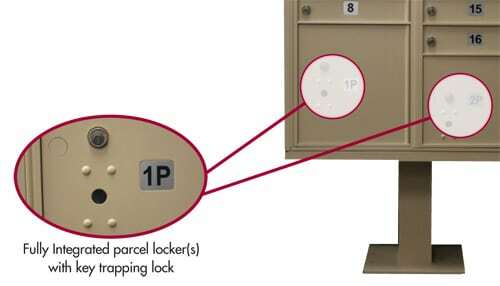 Once the Tenant inserts the key into the parcel locker to retrieve the package, the key remains in the lock and only the postal carrier can then remove the key. The Tenant closes door and leaves the key in parcel locker door lock. 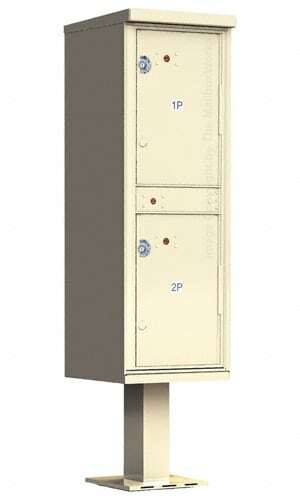 Parcel lockers have a “captive lock,” which means that once the key is inserted into the lock it cannot be removed. The USPS mail carrier will remove the parcel locker key on their next delivery. 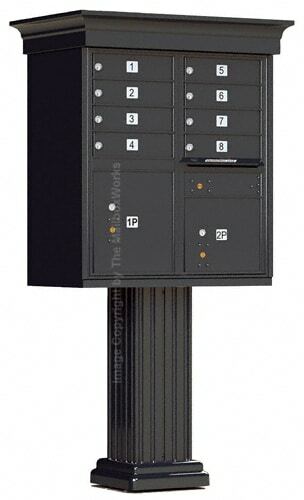 Can I use a parcel locker as a tenant mailbox? No. 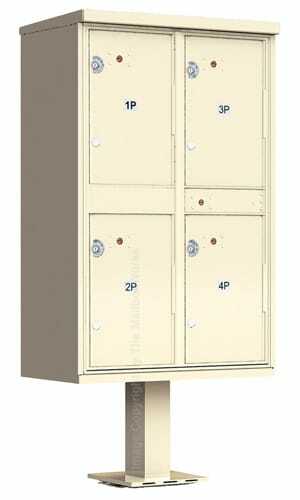 USPS regulations state that parcel lockers on cluster mailboxes cannot be removed, converted into tenant mailboxes, modified, or used for any other purpose other than the original parcel delivery purpose. Do mailbox locks come installed in the CBU mailboxes upon delivery? Yes. All cluster mailbox locks come with locks installed and with 3 keys for each tenant mailbox lock. Can I get more than just 3 keys for a tenant door? You can order up to 6 keys per tenant door if you need more than the standard 3 keys that come with the CBU mailbox unit. Please contact our customer service team by phone at 1-866-717-4943 or by email to discuss this option. Additional tenant mailbox door keys cost around $3.00, depending on quantity volumes. How do I order additional tenant keys after purchasing a CBU? Contact The MailboxWorks to purchase additional blank keys that you can take to any locksmith or hardware store to have cut. Please note that the locks and key blanks on all CBU cluster mailboxes are proprietary and are difficult to source through hardware stores and locksmiths. We’d be happy to source these for you! Typically, Florence Mailboxes, the CBU mailbox manufacturer, will use the same key blank for the CBU cluster mailboxes but it is not always possible, especially for larger orders. Please check each key before ordering any key blanks. Can I order new locks for tenant mailbox doors? If you need to order new locks for your CBU cluster mailboxes please contact The MailboxWorks. The outgoing mailbox door on my CBU mailbox doesn’t have a lock. What should I do? This USPS Arrow Lock can only be installed by USPS upon your request. Please contact USPS for installation. Typically, they do not charge for this service. One box contains the pedestal, which is approximately 25 lbs. One box contains the CBU mailbox model, which ranges from 100 – 150 lbs depending on the mailbox unit size. Any decorative components such as a roof, cap, or pedestal cover will ship in additional individual boxes. We recommend that upon delivery you confirm you have received the right number of shipping boxes. Ensure that the number of boxes agrees with the box count on your delivery receipt provided by the freight company. What if one of my CBU parcels or boxes appears to be damaged upon delivery? Carefully inspect and report any damaged shipping boxes to the delivery person before signing for the delivery of goods. If you notice significant damage you can refuse delivery of the item. We recommend only refusing delivery of the one damaged item and not the entire shipment. Should this occur, please contact The MailboxWorks as soon as possible. In the case that you only notice damage after you sign for the CBU cluster mailboxes please contact The MailboxWorks at 1-866-717-4943 as soon as possible. We recommend taking pictures with your camera to document the damage for the factory and delivery company’s records. Please note that we can best address the issue if you alert us right away. 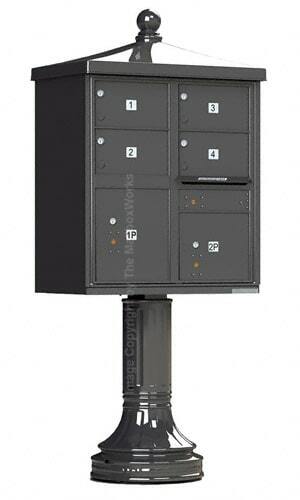 Can F-series cluster mailboxes be reconfigured? No, you cannot change the configuration on any F-series cluster box mailboxes. 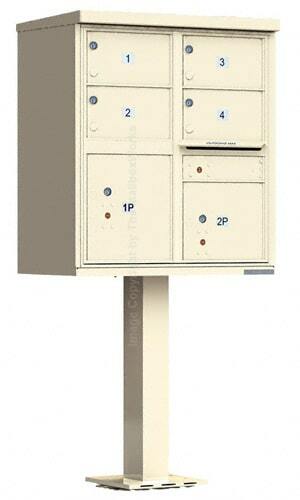 In fact, USPS owns the patents on these cluster mailbox units and prohibits any modifications. Prohibited modifications include resizing, moving, adding, or eliminating any of the mailboxes, parcel lockers, or outgoing mail components. Can I use a CBU mailbox for private mail delivery? Yes, you can use CBU cluster mailboxes for mail and parcels delivered by someone other than USPS. In order to use them for private mail delivery, you will need to purchase a private master conversion lock (CK25750) for both the master door and parcel locker. These conversion locks are available through The MailboxWorks. Can I install a digital combination lock on the CBU mailbox? No, there currently is no wireless cluster mailbox alert system on the market. Can I install a digital combination lock on the CBU? No. Combination locks cannot be installed on CBU cluster mailboxes for private mail distribution in settings like a College, University or offices. The MailboxWorks offers several alternative community mailboxes and multi-mailbox units with combinations locks. Please call us at 1-866-717-4943 or email your requirements to info@mailboxworks.com. We’d be happy to provide you with suggestions! Can I order replacement pins for the cluster mailbox door? Yes, we sell Type III and Type IV long-hinge rods/pins. Because these are specific to each manufacturer we will need to verify your cluster box unit model first. Can I buy a sign holder to attach to the CBU cluster mailbox? We have been asked if we sell plexi sign holders to attach to the CBU mailboxes and house various notices that typically get attached to the side of cluster mailboxes. Unfortunately, we do not sell these at The MailboxWorks. Can I buy a replacement magnet for the front of the mailbox? If you are missing the magnet that permits the front of the mailbox to open, please call us at 1-800-824-9989 for assistance. 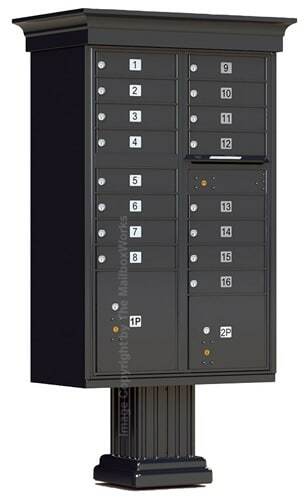 Can I get a CBU cluster mailbox with more or less doors than the standard 8, 12, 13, or 16 door units? Yes. 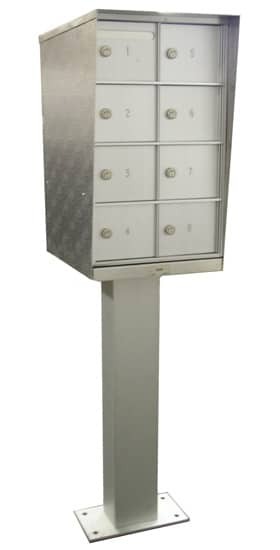 You would be looking at our 4C Pedestal mailboxes that can range from 1 to 29 tenant doors, with a variety of configurations. Are there rear loading cluster mailbox units that open from the back? No. The rear-loading CBU mailboxes are not available. You can purchase a rear loading NDCBU mailbox for private mail delivery. Please note that NDCBUs have been decertified by the USPS. Can I buy a used CBU cluster mailbox at The MailboxWorks? No. For security reasons all CBU mailboxes at The MailboxWorks are new. Can I buy a high-security CBU mailbox? High security CBU cluster mailboxes have been discontinued because most of these security features have been incorporated into the current standard CBU mailboxes on the market. Call The MailboxWorks at 1-866-717-4943 for more information on CBU mailboxes or visit our Request a Quote page.